Inventi Ensemble perform Melody Eötvös’ House of the Beehives. Photo courtest of the artists. From the initial notes of Saturday’s Inventi Ensemble concert, I was struck by the excellent quality of sound produced—the tonal integrity of the acoustic instruments was consistently the central focus and the electronic material was expertly integrated. 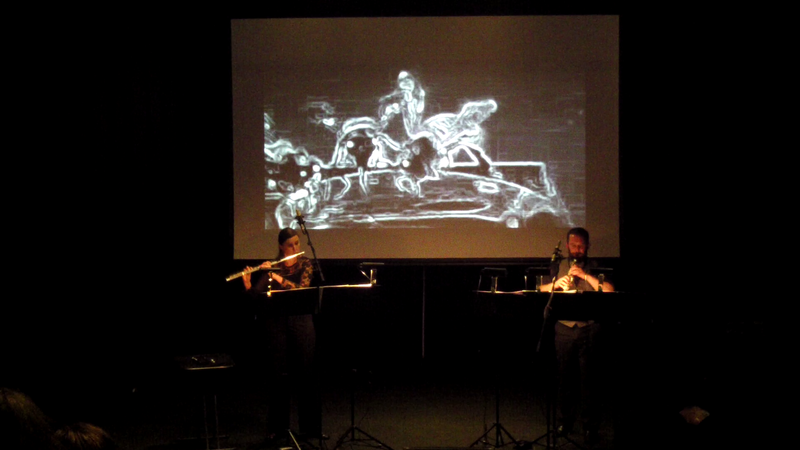 The Stratagem Studio at Bendigo’s Ulumbarra Theatre was the ideal space for sonic and visual close-ups of the flute’s inner workings, the struggles of the Roma people near Berlin, Gauguin in Tahiti and the lives of bees. Listeners were invited into an abundant world of imagery—part projected, part imagined. In Passages (1979) by Jean-Claude Risset, Melissa Doecke’s solo flute interacts with a quaint episodic array of late 1970s electro-acoustics. By switching between the standard flute, its head joint alone, and the piccolo, Risset uses sound to creatively outline the workings of the harmonic series in music. His pioneering research into sound synthesis is apparent as we are reminded that perception of pitch is a response to changing frequencies. The samples were unpretentious, and each event occupied its own tonal area with certainty. The music travelled through changing air streams, touched on a hard-surfaced interlude, before bouncing off more disparate tonal language which was in turn stilled by vocal light at tunnel’s end. Urban Gypsies (2005) by Johannes Kretz for oboe, electronics and film (by Laszlo Moholy-Nagy, 1932) documents and musically narrates the lives of a group of Roma people living on the fringe of the city. Ben Opie’s mournfully pleading oboe conjures faces and words that become more forceful as images of grass and dirt give way to concrete and traffic. Disputes play out as trams and cars vie for prominence while the cries and honks of the oboe are the heart-wrenching anguish of animals being haggled over. People’s futures and pasts are also traded as the well-heeled are offered palm readings to the sound of vinyl cracklings and the oboe’s key clicks. As dice hit a beer stained card table, a tussle ensues which a plaintive child observes, perched upon a fence. A barrel of booze is rolled towards a celebration where women let down their hair and children horse around in dress-ups. The band is at full tilt and the couplings are blurred by fiddles, trills and multiphonics. With Hitler’s rise to power just a year away, I can’t help wondering what fate awaited these poor people. Forty years earlier, Paul Gauguin made his first journey to Tahiti where, along with some of his most famous paintings, he produced a woodcut and travelogue both with the title Noa Noa. Kaija Saariaho’s 1992 work of the same name has become a standard work for flute and electronics, borrowing material from Gauguin’s text. Stage whispers are skilfully combined with quarter-tone recitations, air sounds and multiphonics. Doecke has throughly absorbed the composer’s stance on extended techniques and they are brought to life as the natural extensions of fragrant breath and song. This piece is an excellent example of how sound alone can create a rich and beautiful world of imagery. The final work in the program, Melody Eötvös’ House of The Beehives (2015) was commissioned by lawyer and human rights activist Julian Burnside. The current ecological plight of the bee population is explored here with flute, oboe, electronics and film. With its many blackouts and white flashes, saturated tree-scapes, and close-ups of flowers, the film was a little too reliant on effects, while the music swayed between evoking Celtic chants and upbeat hocketing. The combination left my imagination little room to roam—would simpler footage and greater exploration of the harmonic and textural vocabulary create a more poetic end result? Inventi Ensemble’s Urban Gypsies illuminated many opportunities for multi-disciplinary artists wishing to combine images with sound. Which should take precedence, and how do they interlace to form a clear artistic statement? Perhaps works that are semi-improvised, or composed re-imaginings of obscure or abstract stories, have a greater chance for audience receptivity. They, like readers, are willing to fill in the gaps, imagine the backstories and even glance away to see where else they might be transported.